Archaeologist Joan Breton Connelly offered a significant reinterpretation of one of the western world’s most revered monuments when she presented Howard College of Arts and Sciences’ annual J. Roderick Davis Lecture Oct. 29. Connelly, an award-winning professor of classics and art history at New York University, earned a MacArthur Foundation “Genius” Award in 1996 for her innovative work in Greek art, myth, religion and values. Since 1990, she has directed NYU’s excavations on Yeronisos Island, Cyprus. Her lecture at Samford focused on her latest book, The Parthenon Enigma: A New Understanding of the West’s Most Iconic Building and the People Who Made It. Connelly explained that the Parthenon is a “replacement building” that sits in the space of an earlier, incomplete temple destroyed by Persian invaders in 480 B.C. The trauma of that cultural catastrophe inspired a generation to create works and ideas so compelling that they still resonate in western culture. Their Parthenon, unprecedented in its size and sculptural program, became “the symbol of democracy itself,” projecting the Athenians’ values across the centuries. 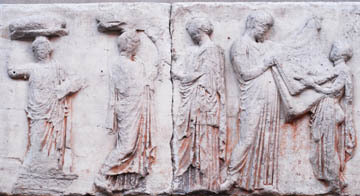 Specifically, Connelly proposes a new interpretation of the frieze panel known as “the enigmatic peplos incident,” in which a figure of a woman is flanked by a man and child displaying a “peplos” (a square of cloth or garment), and two women who appear to bear similar cloth on their heads. Connelly rejects the traditional view that the scene depicts a civic event, the ancient equivalent of a “Fourth of July parade.” She said such a “banal” scene would be unprecedented in Greek temple decoration, which always depict myth. Until relatively recently, scholars have had no evidence for an alternative explanation of this panel. Then, in the 1960s, scientists discovered a fragment of papyrus bearing 120 lines of Erechtheus, a play by Euripides. The lines describe the mythical Athenian king Erechtheus, who seeks the advice of an oracle to save Athens from invaders. The oracle requires the sacrifice of the king’s daughter Chthonia. His despairing queen, Praxithea, makes a patriotic speech in which she describes and claims the responsibility to sacrifice one to save all. Chthonia’s two older sisters vow to kill themselves as well. The daughters die, and Erechtheus is killed in battle, but Athens is saved. At the end of the play, Athena tells Praxithea to bury her daughters and husband on the Acropolis in separate temples and be their first priestess and caretaker. Connelly believes that the peplos scene represents this myth, with its profound message about personal sacrifice for the good of community. In her interpretation, the figures of the panel represent Erechtheus and Chthonia with her sacrificial garment, the older sisters bearing their own shrouds and, at center, the queen and priestess Praxithea. Other scenes on the frieze match Athena’s instruction to Praxithea to honor these heroes annually with cattle sacrifice and offerings of water and honey.